The Skytap Automation Pack for IBM UrbanCode Deploy provides a set of pre-packaged actions for provisioning Skytap environments in an IBM UrbanCode Deploy workflow. Throughout the Skytap Automation Pack for IBM UrbanCode Deploy, sharing portals are called published URLs. Download the automation pack from the Skytap GitHub page. In UrbanCode Deploy, click Settings > Automation Plugins. Browse to the automation pack you downloaded earlier, and click Submit. After it’s loaded, the Skytap Automation Pack for IBM UrbanCode Deploy is displayed in the list of Automation Plugins. Skytap actions is available in the Available Plugin Steps panel in IBM UrbanCode Deploy process design pages. 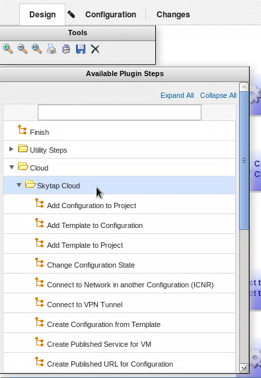 Once you’ve installed the automation pack, you can add Skytap action steps to your workflow. Each step requires some inputs, which are described in more detail below. Some steps may also produce outputs that can be used as inputs in later steps. These are also described below. The Skytap authentication step ensures that all later Skytap action steps are authenticated and integrated with your Skytap account. Authentication key Your Skytap API token. See Finding your username and API security token. This step adds an environment in Skytap to a project. Configuration ID The ID of the Skytap environment. The default value is the configID output property from the Create environment from template action step. Project Name The Skytap project name. If two or more Skytap projects have the same name (not recommended), the last matching project in the metadata project list is used. Username Your Skytap user name. 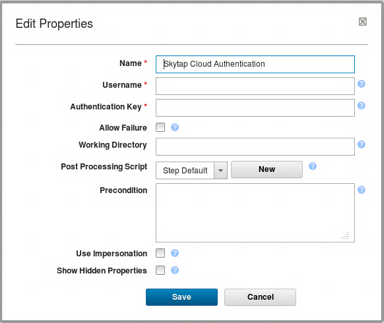 The default value is Username from the Skytap authentication action step. Authentication Key Your Skytap API security token. 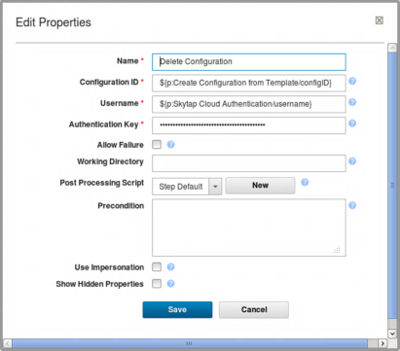 The default value is password from the Skytap authentication action step. 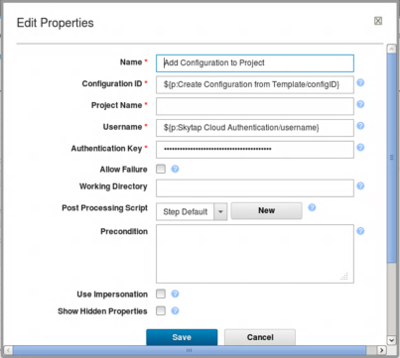 This step adds a VM from a template to an environment in Skytap. Template ID The ID of the Skytap template. To use a template created earlier, enter the templateID output property from the Create template from environment step. Environment ID The ID of the Skytap environment. The default value is the configID output property from the Create environment from template action step. This step adds a Skytap template to a Skytap project. Template ID The ID of the Skytap environment. To use a template created earlier, enter the templateID output property from the Create template from environment step. This action runs, suspends, or shuts down the environment. New Environment State Running, Suspended, or Shutdown. For a description of these options, see Running and stopping VMs and environments. When actions connects the networks in two different Skytap environments. The network subnets in the two environments must already be configured to allow an ICNR connection to occur. For more information about ICNR, see Networking between environments. Source Environment ID The ID of the Skytap environment you want to connect. To use an environment created earlier, enter the configID output property from the Create environment from template action step. Source Network Name The name of the network in the source environment. If the environment has two or more networks with the same name (not recommended), the last matching network in the environment metadata is used. Target Environment ID The ID of the Skytap environment you want to connect to. The default value is the configID output property from the Create environment from template action step. Target Network Name The name of the network in the environment you want to connect to. This network must be configured to be visible to other networks. 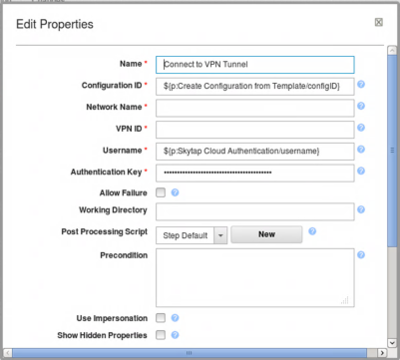 This step connects a network in an environment to a VPN in Skytap. Environment ID The ID of the Skytap environment you want to connect to the VPN. The default value is the configID output property from the Create environment from template action step. Network Name The name of the network in the environment you want to connect to the VPN. VPN ID The ID of the Skytap you want to connect the environment to. This steps creates a Skytap environment from a Skytap template. Template ID The ID of the Skytap template. To use a template created earlier, enter the templateID output property from the Create environment from template step. configID The ID of the Skytap environment. 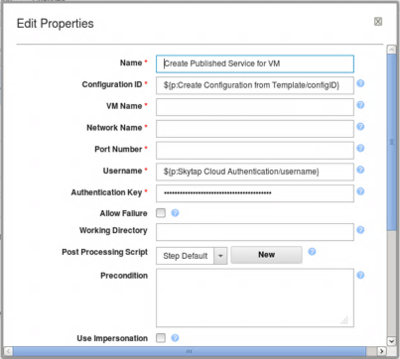 This step adds a published service to a VM in an environment. For more information, see Accessing VMs with published services. Environment ID The ID of the Skytap environment you want to connect to the VPN. The default value is the configID output property from the Create environment from template step. VM Name Name of the VM you want to attach the published service to. If the environment has two or more VMs with the same name (not recommended), the last matching VM in the environment metadata definition is used. Network Name The name of the network you want to attach the published service to. If the VM has two or more networks with the same name (not recommended), the last matching network in the environment metadata is used. Username Your Skytap user name. The default value is Username from the Skytap authentication step. Authentication Key Your Skytap API security token. The default value is password from the Skytap authentication step. serviceAddress The text of the public URL and port in the format public-URL:port-number. This step creates a Skytap sharing portal that can be used to share the environment. For more information, see Sharing VMs and environments with sharing portals. Environment ID The ID of the Skytap environment you want to share. The default value is the configID output property from the Create environment from template step. Published URL Name Name of the sharing portal. Published URL Permissions Sets the permission level for each VM in the environment. One of View Only, Use, or Full Control. For a description, see Sharing VMs and environments with sharing portals. Published URL Password Optional password used to restrict access to the sharing portal. This step creates a new environment from a template in Skytap. Environment ID The ID of the Skytap environment. The default value is the configID output property from the Create environment from template step. This step deletes an environment in Skytap. 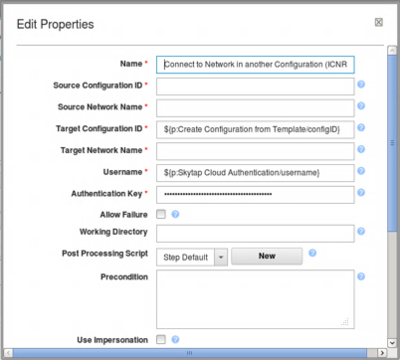 This step locates the ID of a VM in Skytap. 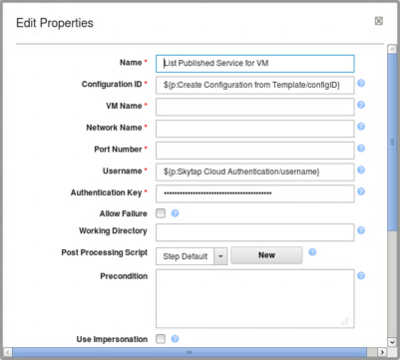 The step lists the published service on a VM in Skytap. Network Name The name of the network the published service is attached to. Port Number The port number the published service is using. 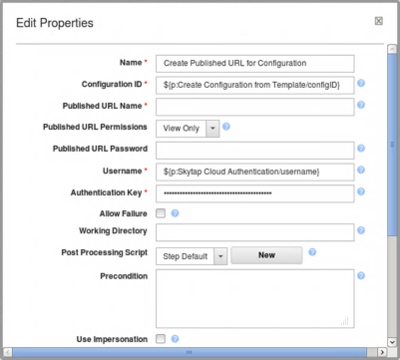 This step lists the sharing portal associated with an environment in Skytap. This step does not list sharing portals for individual VMs in a environment. If the environment has two or more sharing portals with the same name (not recommended), the last matching sharing portal in the environment definition is used. 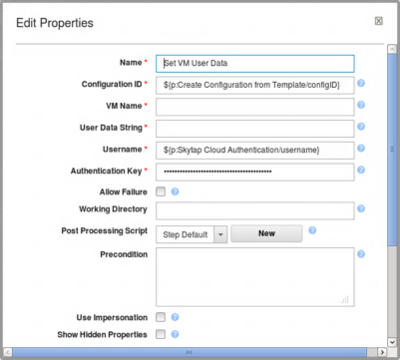 This step adds text to the VM user data field for use in automation scenarios. For more information, see Accessing the VM metadata service. Any previous text in this field is overwritten. If the environment has two or more VMs with the same name, the last matching VM in the Skytap environment metadata definition is used. User Data String The string value you want to place in the VM user data field.